If your child loves robots, tinkering, engineering, and science, this is the place to be. Your child must be motivated, self organized, and most importantly, focused. Click on the "How to Join" subpage to find out how you can participate! We build robots using the VEX iQ Robotics kit and compete in an annual challenge. The VEX IQ Challenge provides an opportunity for students, to explore and solve exciting science, technology, engineering, and mathematics (STEM) challenges. Students develop valuable knowledge, skills, and experience and a tremendous sense of accomplishment in designing, building, programming and testing a robot to solve the VEX IQ Challenge. Please follow link for more info on VEX IQ Challenge. I'm your robotics mentor, Hisa Yoshikawa. I borrow from my engineering background to fill the robotics curriculum with geometry, physics, and programming lessons. As a project management professional, I aim to develop organizational, social, and analytic skils in my kids. The program is co-lead by Marley Tokunaga-Isaacs, who has extensive VEX experience, co-leading the Baldwin high school team to two national championships. For this school year, we are excited to welcome student coaches Denmark, Roxanne, and Sydney, from Maui High robotics to help coach the kids. PROGRAMMING TEAM - "Da kai-no-jas"
On February 20th, the Pomaikai robotics teams will be travelling to Oahu for their 2nd straight VEX IQ State Championship Tournament. The Robotex and Swags competed in two county tournaments in November and December of 2016. We qualified for the state champion by respectively scoring the 13th and 20th highest scores out of a field of 148 qualifying teams from across the state for the season. On February 6th, 2016 the Robotex and Swags traveled to Oahu to compete in the VEX IQ State Championship. "This is the best day ever in my life!" While the season has been exhausting and trying at times, it's comments like these from our kids that makes it all worth while. It was great seeing Honu Pride exhibited so brightly and brilliantly at the State championship level of competition. Thanks for a wonderful season. While we will not be continuing our journey to World competition, the Pomaikai robotics journey will continue. In the coming weeks, we will continue to build on what we've learned so far and make continuous improvements to apply lessons learned. We will also begin recruiting for our next class - and current team members will get ready to mentor new team members. When next year's game is revealed end of April at the World competition, we will be kicking off the 2016-17 season! In December, the Swags team won the THINK award and qualified for state finals in January, thanks to their high score in the programming challenge. The Robotex team won the Elementary School Excellence Award in October. 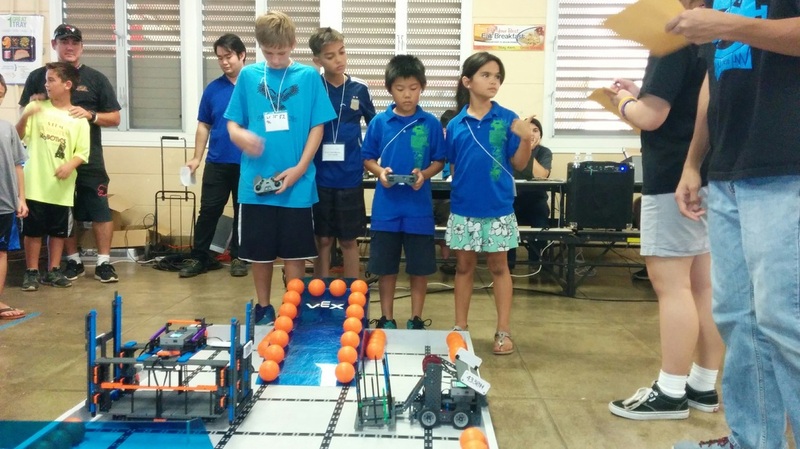 092915Robotics from Pomaikai Elementary on Vimeo. Speed, Torque, Power - race car vs. monster trucks. Want speed or strength? ​Center of Gravity - why did the robot fall over? why is it unstable? Turning Scrub - Why is it hard to turn this thing? Lifting Mechanism - I need to lift something up, how can I? See different mechanism in action on YouTube here.